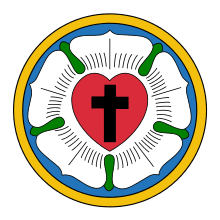 Matthias Flacius Illyricus (Latin; Croatian: Matija Vlačić Ilirik) (3 March 1520 – 11 March 1575) was a Lutheran reformer from Istria, present day Croatia. Flacius was born in Labin in Istria, son of Andrea Vlacich alias Francovich and Jacobea Luciani, daughter of a wealthy and powerful Albonian family. His mother's uncle was the Lutheran Baldo Lupetina who later was condemned to death in Venice for his faith. He lost his father during his early childhood. At the age of sixteen Flacius went to study in Venice where he was taught by the humanist Giambattista Cipelli (Baptista Aegnatius / Battista Egnazio). At the age of seventeen, he intended to join a monastic order, with a view to sacred learning. His intention, however, was diverted by his uncle, Baldo Lupetina, provincial of the Franciscans and sympathetic to the Reformation cause, who convinced him to start a university career. Flacius continued his studies in Basel in 1539, then went to Tübingen and finally ended up in Wittenberg where in (1541) he was welcomed by Melanchthon. There he came under the influence of Martin Luther. In 1544, Flacius was appointed professor of Hebrew at Wittenberg. He finished his master's degree on 24 February 1546, ranking first among the graduates. Soon, Flacius was prominent in the theological discussions of the time, opposing strenuously the Augsburg Interim, and the compromise of Melanchthon known as the Leipzig Interim. Melanchthon wrote of him with venom as a renegade (aluimus in sinu serpentem, "we have nourished a snake in our bosom"). In 1549 Flacius moved to Magdeburg. 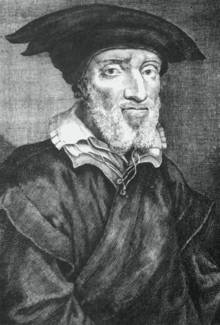 On 7 May 1557 he was appointed professor of New Testament at the theological faculty in Jena but was soon involved in controversy with his colleague Victorinus Strigel on the synergistic question (relating to the function of the will in the conversion). Affirming the natural inability of man, he adopted a position on sin as not being an accident of human nature, but involved in its substance, since The Fall of Man. Holding to a strong view of what Calvinists later called total depravity, Flacius insisted that human nature was entirely transformed by original sin, human beings were transformed from goodness and almost wholly corrupted with evil, making them kin to the Devil in his view, so that within them, without divine assistance, there lies no power even to cooperate with the Gospel when they hear it preached. Human acts of piety are valueless in themselves, and humans are entirely dependent on the grace of God for salvation. Those that agreed with him on this point, for example, Cyriacus Spangenberg, were termed Flacians. Resisting ecclesiastical censure, he left Jena in December 1561 to found an academy at Regensburg. That assignment was not successful, so in October 1566 he accepted a call from the Lutheran community at Antwerp. Thence he was driven in early 1567 by the exigencies of war, and went to Frankfurt, where the authorities stood against him. He proceeded to Strasbourg where he was well received by the superintendent Johannes Marbach. Here again, his religious views caused controversies. The authorities ordered him to leave the city by May Day 1573. The prioress Catharina von Meerfeld of the Convent of White Ladies secretly harboured him and his family in Frankfurt where he fell ill and died on 11 March 1575. Flacius' life was eventful in a turbulent epoch. He represents in some sense a move in the direction of the scientific study of church history in the modern sense and similarly of hermeneutics, though no doubt his impelling motive was non dispassionate but polemical, namely to prove the false premisses of Roman Catholicism. But he did not polemicize with Catholics alone and his litigious temperament has caused him generally to be passed over as distasteful by historians. 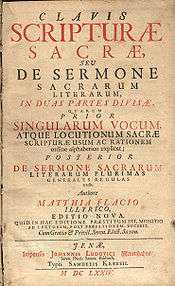 The contribution of the principles expressed in Flacius' Catalogus testium veritatis (1556; revised edition by J. C. Dietericus, 1672) and his Clavis scripturae sacrae (1567), followed by his Glossa compendiaria in N. Testamentum (1570) would perthaps merit reconsideration. His characteristic formula, historia est fundamentum doctrinae, is better understood now than in his own day. In 1545, while at Wittenberg, Flacius married a pastor's daughter. He had twelve children with his first wife before she died in 1564. He remarried the same year in Regensburg and had six more children with his second wife. His son Matthias Flacius Junior was professor of philosophy and medicine at Rostock. Franolić, Branko (1984). An Historical Survey of Literary Croatian. Nouv. éd. latines. ISBN 978-2-7233-0126-8.